Summer has arrived and the Auburn University College of Veterinary Medicine wants you to know about the effects of summer heat on pets. As the temperature increases, be aware that hyperthermia (overheated temperature) affects your pets and know what the symptoms look like. Understanding and recognizing the symptoms allows you to help ensure your pet is healthy and has a great summer. 1. Never leave your pet in a parked vehicle on a hot day. The temperature in a car can quickly rise into the deadly zone. Cracking windows will not help keep your pet cool. 2. Leave plenty of fresh drinking water. Pets can become dehydrated very quickly in hot weather. Dogs do not have as many sweat glands as humans so they mostly regulate their body temperature by panting. Cool drinking water will help them cool down internally. If you must take your furry friend outside for an extended period of time, make sure you bring icepacks or cold towels with you to help regulate their body temperature. If icepacks or cold towels are not available, make sure sufficient shade is available. If your pet is having any symptoms of hyperthermia, it is very important to get them to your veterinarian. 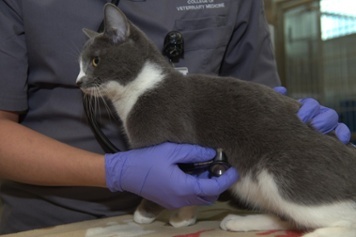 Your veterinarian can help your pet from experiencing long-term effects. 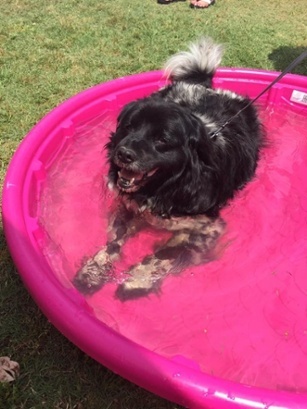 Helping your pet “Beat the Heat” and preventing hyperthermia is not always easy. Animals’ temperatures are more susceptible to change and at a much faster rate than people. If you see your pet showing signs of overheating, please contact your veterinarian. If you believe your pet is suffering from heat stroke, an immediate trip to your local veterinarian or a veterinary emergency clinic, like the Emergency and Critical Care Service at the Bailey Small Animal Teaching Hospital, is warranted.